I finally had time to make it to the new doughnut place at the Curve. Ever since they announced their opening in the papers last weekend which I totally missed, it's been packed with people that there has already been a few blog reviews. It's located behind TGIF next to the yet to open The Apartment. According to the people who work at this place, they say the doughnuts are based on a recipe from New York. Not too sure about it since there's no mention about a Big Apple Donut franchise if I google. 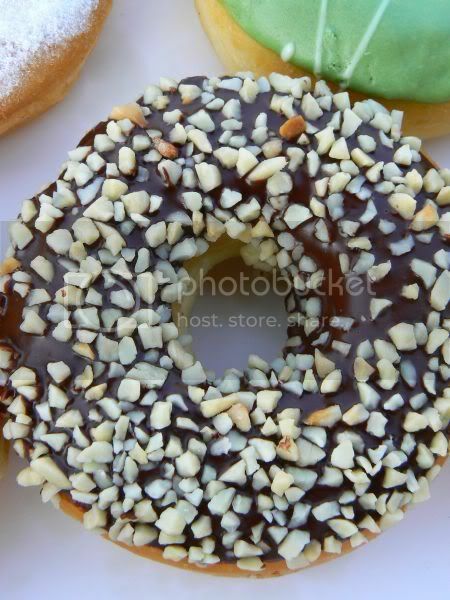 It looks like this could be a similar doughnut set up to the ones who are now cashing in on the Krispy Kreme fame. Guess it's a good idea to bring this in and start a trend to reap the monies before the actual Krispy Kreme arrive on our shores. Kinda reminds me of the same business model the two doughnut places in Singapore are doing at Raffles Shopping Centre and at Vivocity where people queue up for their doughnuts. Currently the opening promotion is buy twelve doughnuts at RM17 and get half a dozen doughnuts for free. 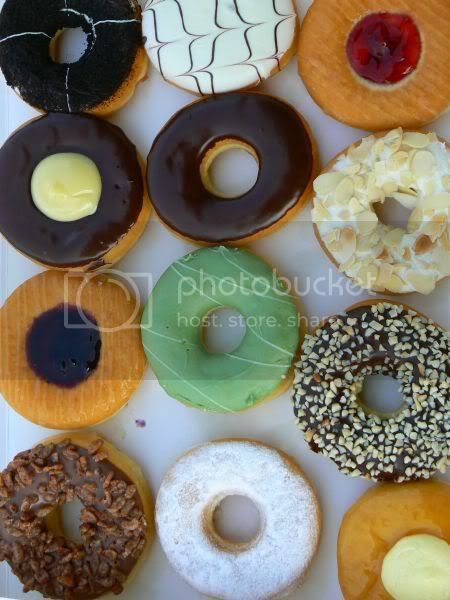 Note that for the twelve doughnuts, you can choose the various types but for the free doughnuts they only give you Glacier doughnuts which is simply glazed. 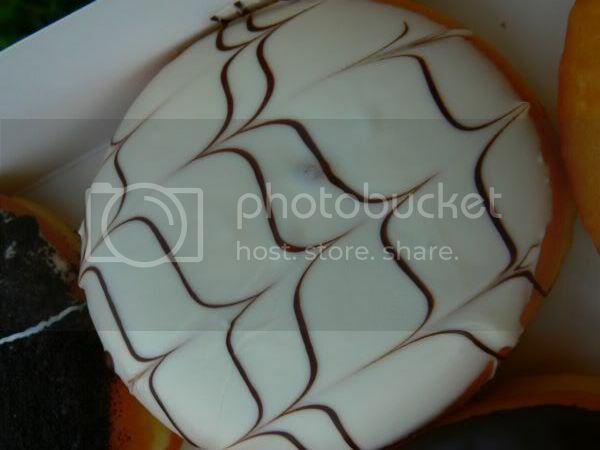 If you order a drink (not mineral water) as they also serve various coffee and teas, you can also get a free Glacier doughnut. Signages are quite sparse when it comes to the types of doughnuts they offer and when I was there, not all the glass trays at the display counter were filled up. From a piece of paper stuck at the wall of their open plan kitchen, I counted a total of seventeen varieties but I've only managed to identify sixteen varieties. 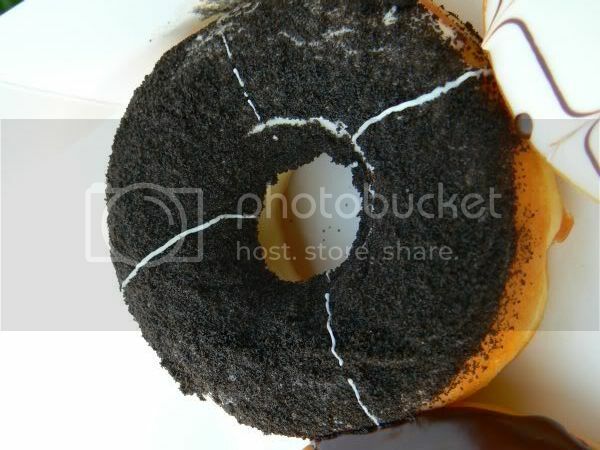 The kitchen is open plan and pretty small with emphasis on the doughnut glazing machine while toppings is added by hand. 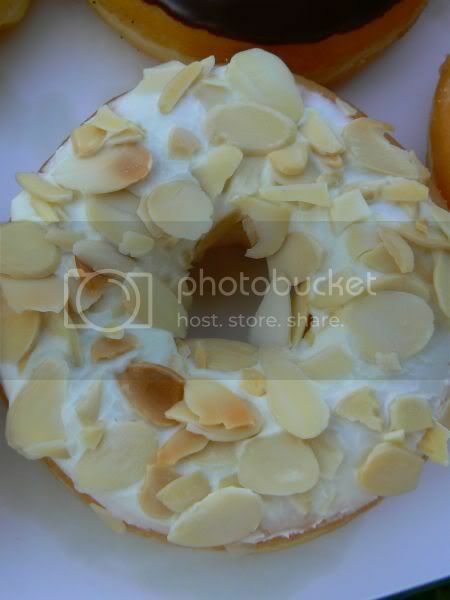 This first one is called California Almond - topped with icing and flake almonds. Not bad and not too sweet. 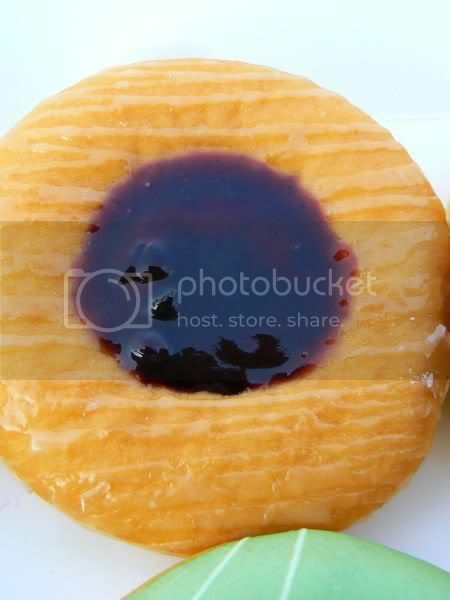 This one is called Cool Blue as it has blueberry jam in the middle while the sides are dipped in a glaze. 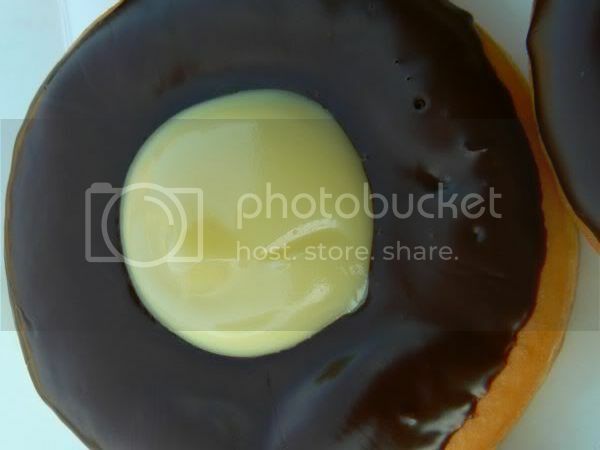 This is the Banana Rama - glazed with dark chocolate on the side and in the middle a dollop of strongly flavoured banana cream. 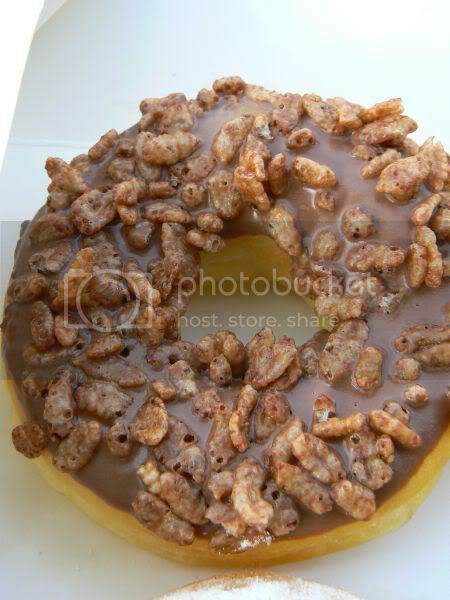 This is the Walnut - dark chocolate glazed with chopped walnuts on top of it. 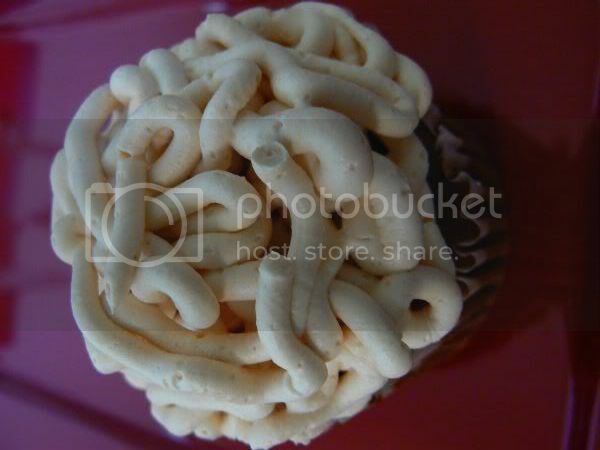 This one is the Witnut which comes with a peanut butter filling and a white chocolate topping. This is similar to the Ice Blue except this is called Hot Berry and comes with a strawberry filling. 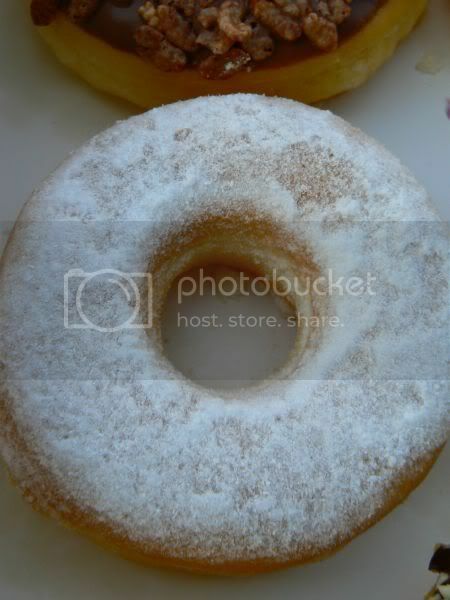 This is their Snowy doughnut which is just a plain doughnut topped with icing sugar. This is the Choreo - topped with powdered oreo cookies. 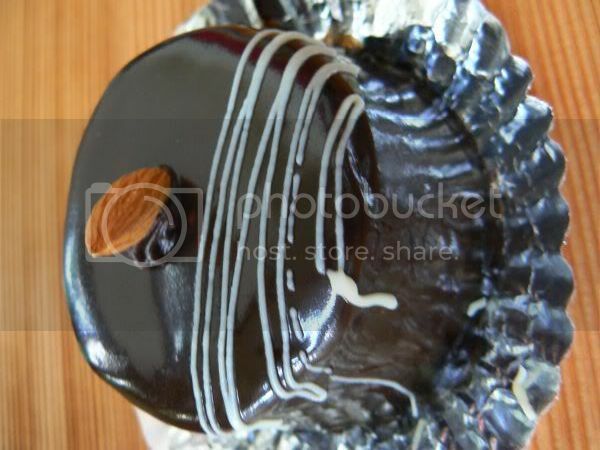 This is the Cocoring which is topped with Belgian dark chocolate. 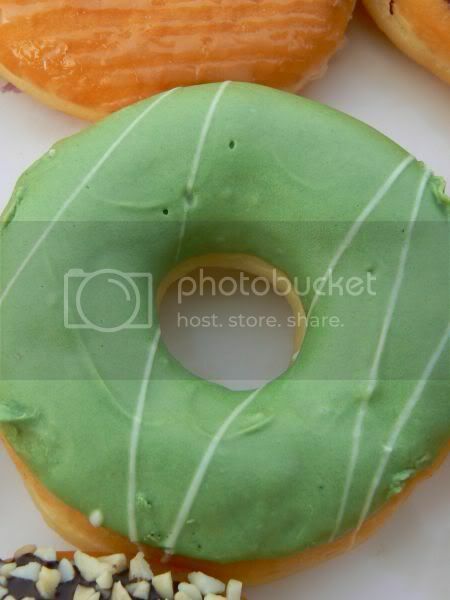 This one is known as the Green Teaser whereby the topping is green tea. 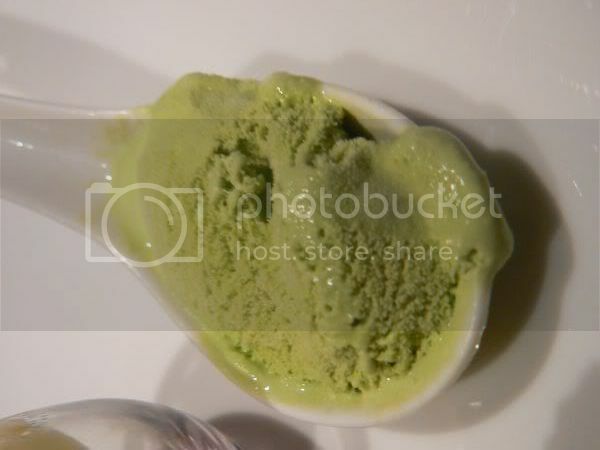 The flavour is quite subtle that it's not easy to figure out the taste of the green tea. 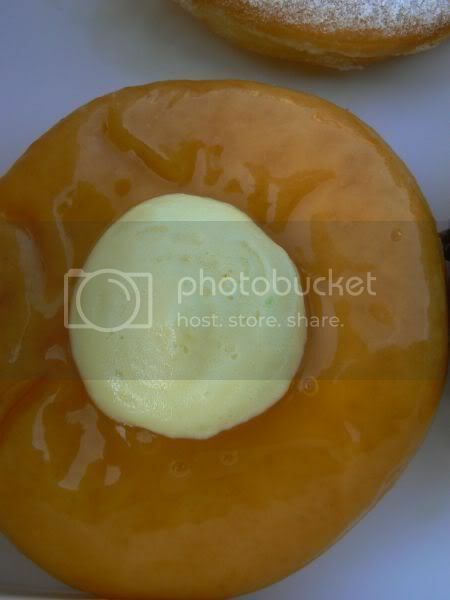 This one is the Mango Tango - topped with mango cream and glazed. This has a cute name - Moonraker where it's milk chocolate glazed and sprinkled with Coco Pops which they claim is James Bond favourite. Aside from these ones, there's the Glacier, Semi-Glacier which is less sweet, Iceberg (has vanilla and cream) and Simply Cheese which I know of. The doughnuts tend to be not very sweet and quite soft. Some reckon Dunkin Donuts is better as it's bigger and has more bite to it. Note that Dunkin Donuts and Big Apple Donut is selling each doughnut for RM2 but one dozen doughnuts is RM18 at Dunkin Donuts and slightly cheaper in Big Apple at RM17 but smaller. 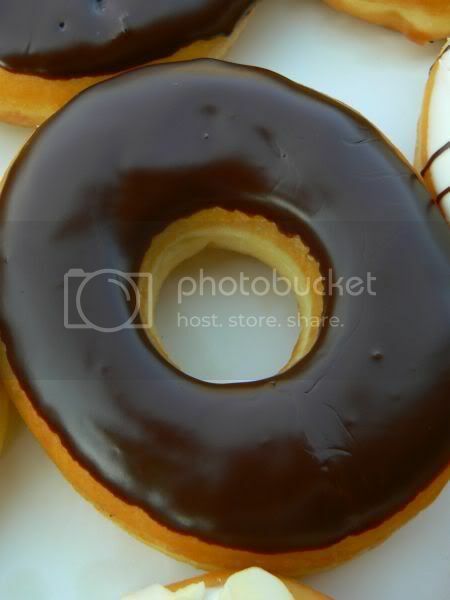 Half a dozen doughnuts at Big Apple is RM9.50 but RM10 at Dunkin Donuts. The boxes are pretty nifty - huge flat one for the one dozen doughnuts with detailed instructions to keep it refrigerated and to warm it up for 8 seconds in the microwave. 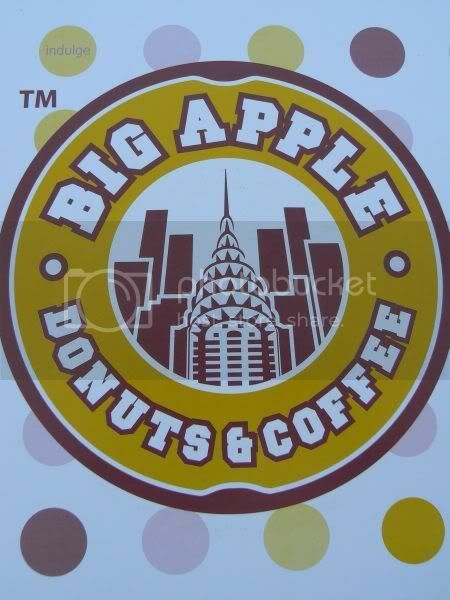 Per an annoymous comment left on Eat First Think Later's blog, the concept for Big Apple is exactly like an Indonesian chain of doughnut company called J.Co Donuts and Coffee. Strange but their website is down but this blog, A Guide to Organized Chaos by Aidil & Shaz has pictures of the J.Co doughnuts they sampled. 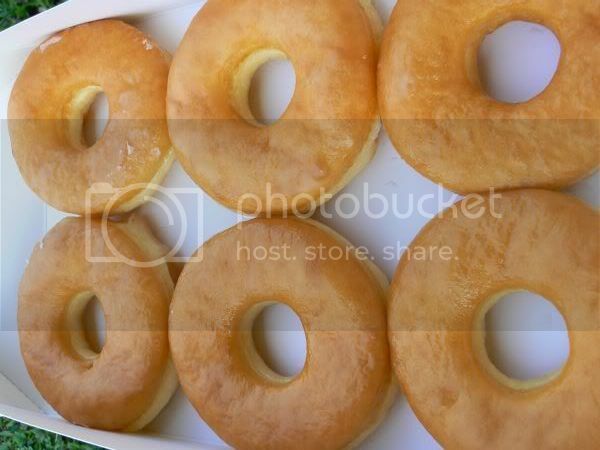 Check the similarity of the design of the doughnuts right down to the glass trays and labels used at the shop which is the same as Big Apple Donuts. Call me old fashioned but I tend to prefer coffeeshops versus the newer Hong Kong style cafes which are found all over town. This is one of my old haunts - this noodle place in SS2. 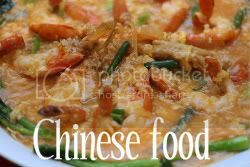 Originally from Kuala Lumpur, Ho Weng Kee moved to Petaling Jaya for quite a few years and has been holding it's own at their outlet. They're famous for their noodles and my preferred choice is always the ngau lam (beef brisket) version. The noodles are always top notch here with a not too hard but still chewy nature. The day I tried my ngau lam noodles, the beef brisket was a tad bit fat though but very tender. If you don't like beef, try their braised chicken feet and mushroom which is pretty good too. Their curry noodles is also absolutely delicious. 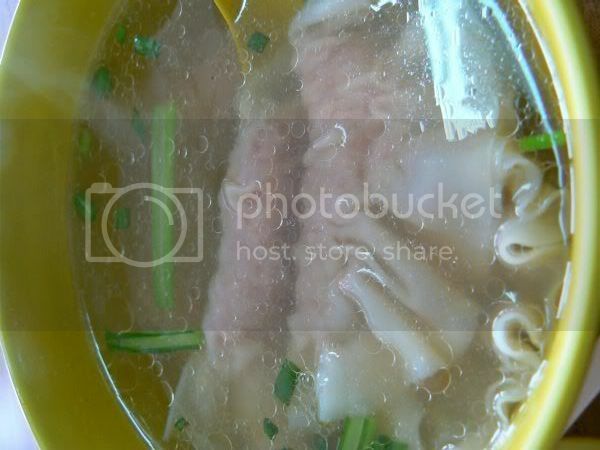 Another thing I must have when I dine at Ho Weng Kee is a bowl of their sui kau. Although not as crunchy as other places, it tastes pretty good especially with my plate of ngau lam noodles. Do take note that prices here tend to be more expensive that the other stalls. I finally decided to sample the Just Heavenly cakes last week but it took me a while to put it up as we slowly savoured the items. 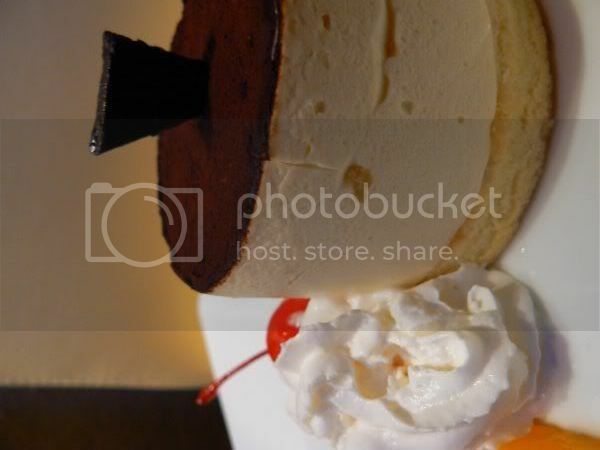 Our absolute favourite is their Banana Cream Pie shown in its full glory above. We love the crust - so light, crumbly and with a crunch from the crushed biscuits. 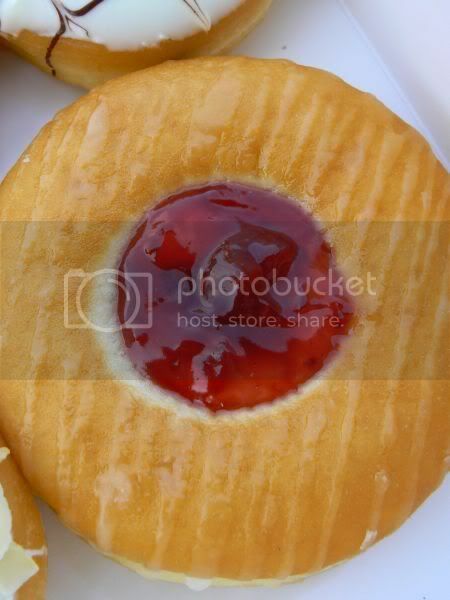 It's a twist from the usual pies you get since they didn't use a shortcrust pastry but a biscuit crust instead. 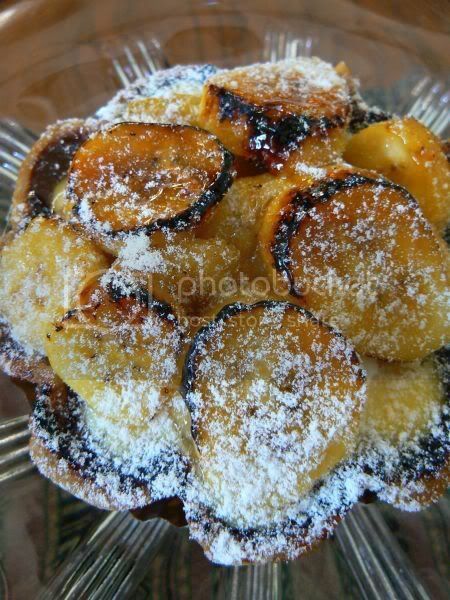 Kind of a coincidence as I was reading a Fine Cooking magazine just the past week which was extolling the ease of using a biscuit crust for tarts. There's a nice layer of melted chocolate on the crust which is topped with the light as feather cream. Final layer has sliced bananas with a sprinkling of icing sugar. They don't make too many quantities of the pie so if you do see it, grab it as it's sublime. Here's the famous chocolate durian which was all mine since Splashie Boy hates durian. I had slid a knife through the cake to cut a tiny slice and the moment it opened, a whiff of durian popped out. 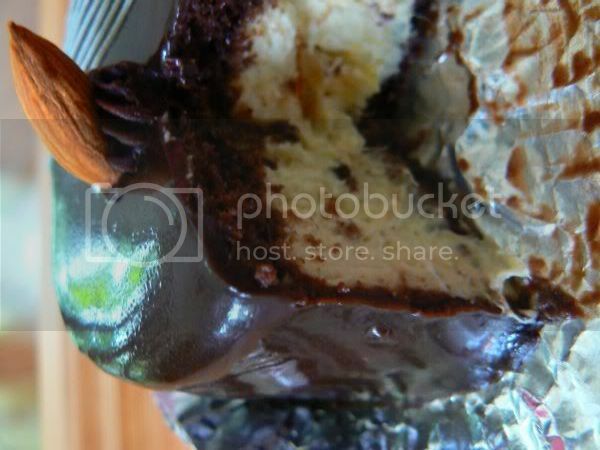 If you see the cross sectional of the cake - it's about three quarters filled with the durian mousse with just a tiny layer of chocolate cake to balance the taste. Topped with a chocolate ganache, the flavours from the rich and creamy durian mousse actually melds together very well with the slightly bitter chocolate. Looks like this may be a new trend in say chocolate buffets - dip your durian in the chocolate fountain for additional pleasure. I had also gotten a profiterole and a rum ball to sample. Their profiterole is not the crunchy type but more towards the cream puff type I remember my mother making when I was young. Filled with pastry cream, it was eaten in a few seconds between the two of us. 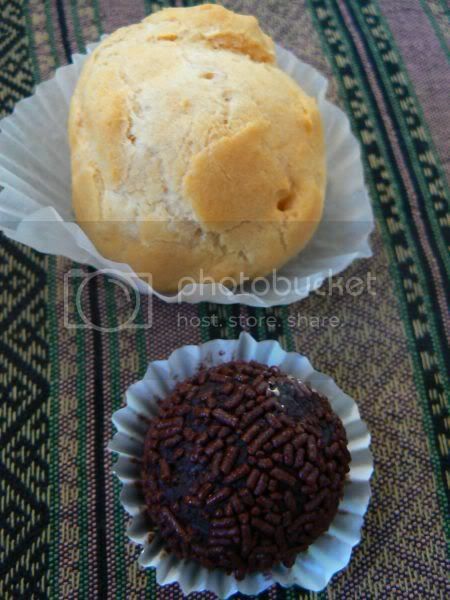 The rum ball was also delicious and filled with lots of good stuff inside like orange peel and almonds. I had also bought the sticky toffee with its interesting whirls on top of the cupcake. Unfortunately I didn't get to taste this as Splashie Boy took it home where he has a microwave. This needs about fifteen seconds in the microwave for it to melt the toffee topping before you can savour it. Drop by their new shop to get a feel of their cakes. I find their cakes to be not as sweet as the other commercial offerings and the varieties offered are unusual. There's not many whole cakes except their Death by Chocolate Cake and the Cheese Chocolate Cake. If you do want a whole cake, you will need to order from them. 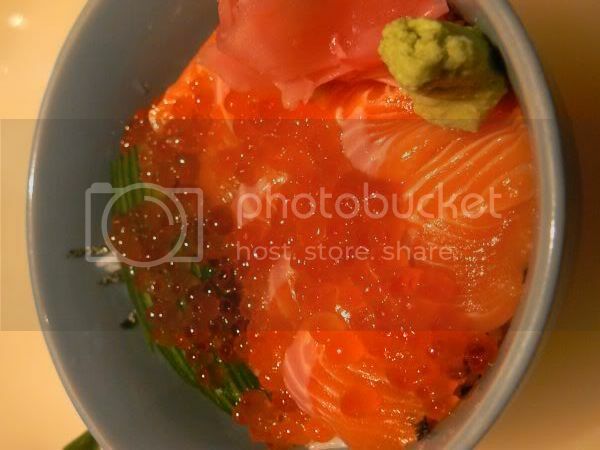 Last Friday, it was RSVP at the newish Japanese restaurant in Northpoint, Ninja Jones. There's an impressive entrance where you need to press a button to open the metal doors, black clad ninjas serving you, cascading water behind the staircase and the robatayaki with the display of all the grill items. You can also sit around this area to watch the chefs prepare the food. This izakaya place is owned by the same people who own Ozeki and Hanabi. Looks like they used to own Oishi too as they served us on the old plates. We met up with the other bloggers, Lyrical Lemongrass and her husband the Bald Eagle, Nigel Skelchy of Kampungkayell and FoodieLianne. As the restaurant was huge, tables were well spread out hence you don't really get to see other people dining so we had our nice little nook. As and when you sat down, they will serve you your food and of course the infamous Martell cocktails. No drinks for me since I was still on medication. To start, we had a plate of salad. 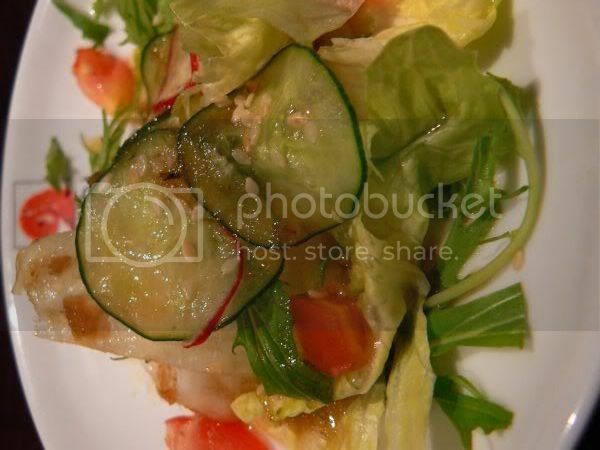 Just a mix of vegetables of lettuce, sliced cucumbers and radish tossed in a light dressing. The appetisers came in tiny plates for us to sample - first was the Shira-ee which was steamed vegetables with beancurd. 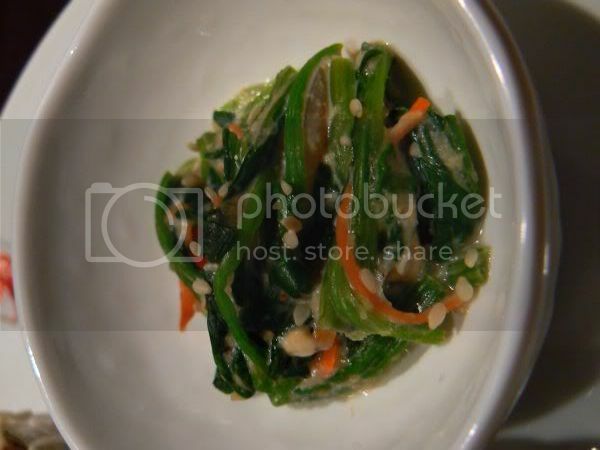 The beancurd is mashed and coats the spinach and tossed with sesame seeds. Pretty good and refreshing. 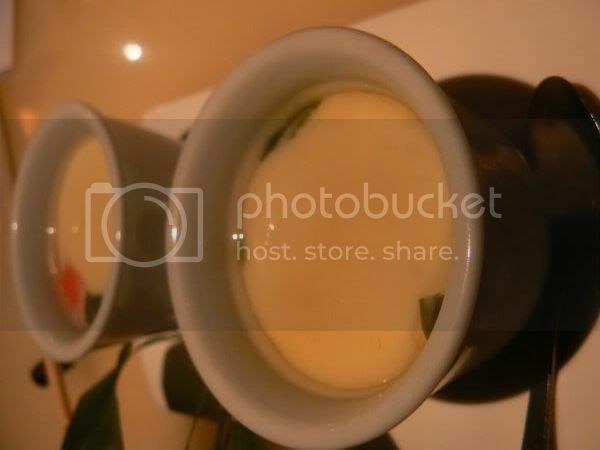 I liked this a lot - the mixed foil yaki, a mixed mushroom soup with lemon. 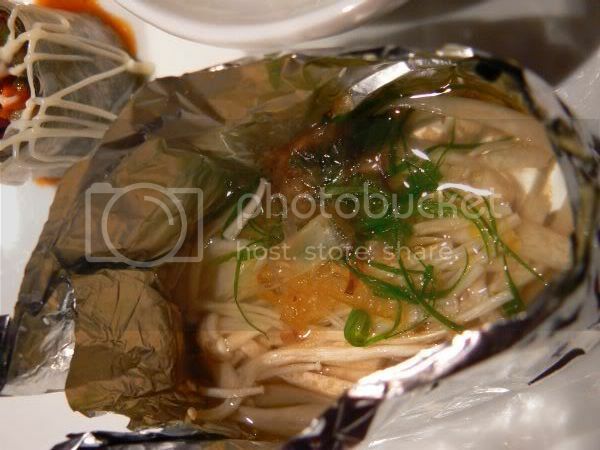 The soup is nice and sweet and filled with sliced enoki and mushrooms. Delicious to the last drop. This was just a sampler size but if you see the first picture, it's about RM20 if you order a la carte and I would imagine a bigger portion. The last appetiser was their Yasai Naraharumaki, the fresh vegetable spring roll which came drizzled with Japanese mayonnaise. 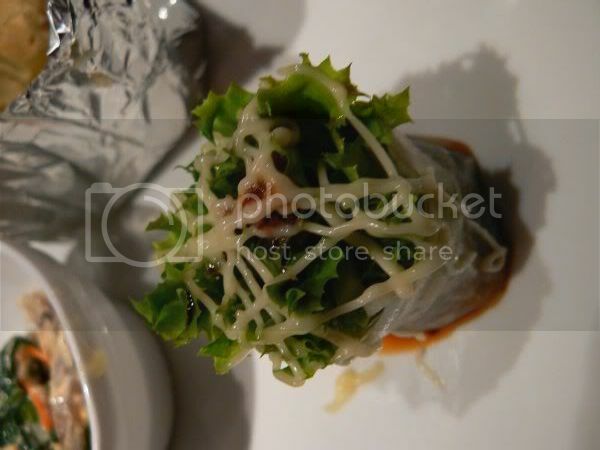 This is the same roll but this version had a fluffy lettuce leaf stuffed inside it. Both the rolls got our thumbs up. For mains, they served their Ninja Millefeuille. This version is the goose liver and chicken on radish. 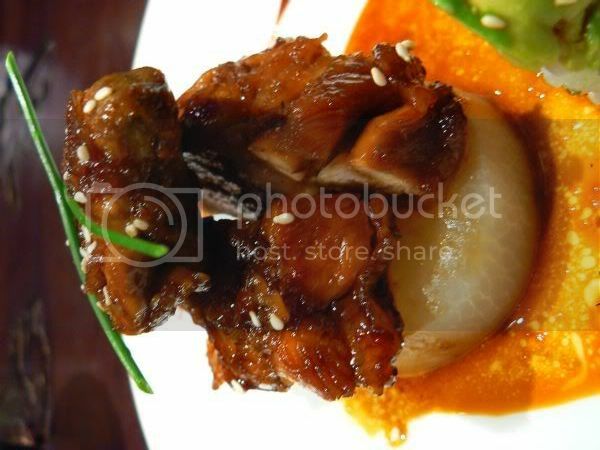 The chicken is coated in a sweetish teriyaki sauce which you eat with the tender goose liver. 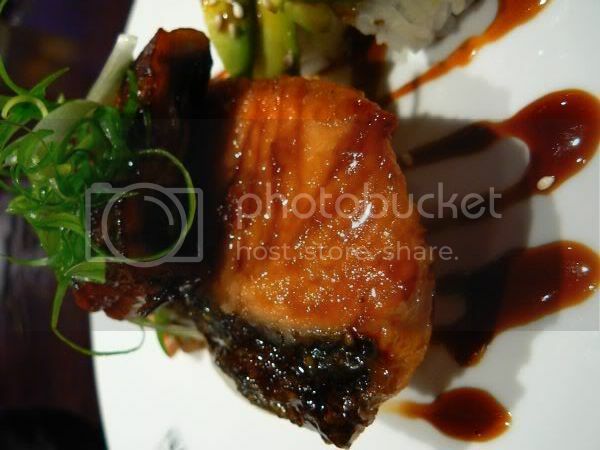 The fish version came with pieces of salmon teriyaki topped with unagi. Although the salmon was slightly overcooked and dry, it tasted good. 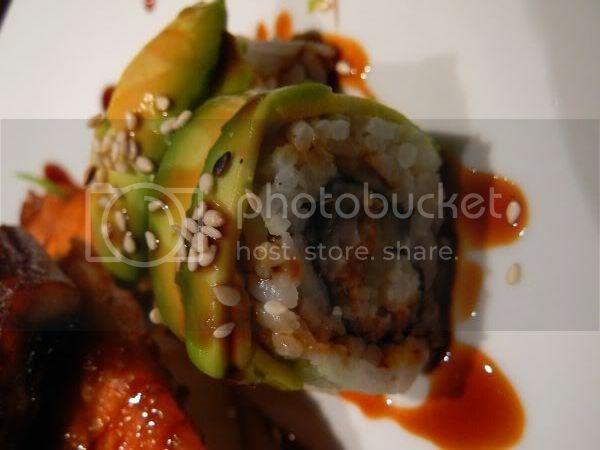 Both the mains, came with a portion of avocado sushi roll which was very good especially with those melt in the mouth avocado slices. 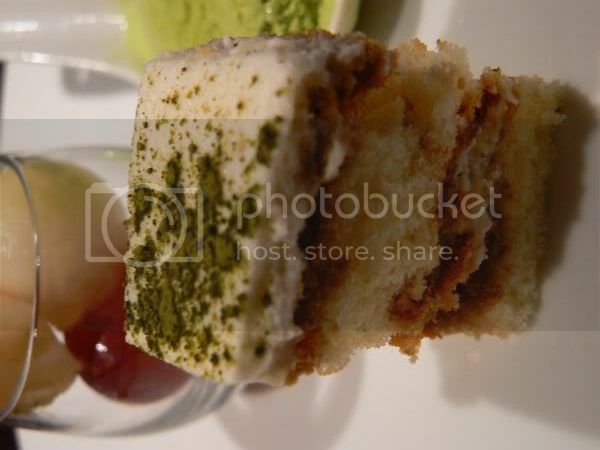 We were then served a dessert platter - fresh fruits, tiramisu and green tea ice cream. The tiramisu was more like a sponge cake with cream versus the traditional version we are all used to hence it got the thumbs down. The ice cream was good but such a small portion. Although most of the items served was quite small, it did offer us a chance to sample the food at Ninja Jones which was the idea. 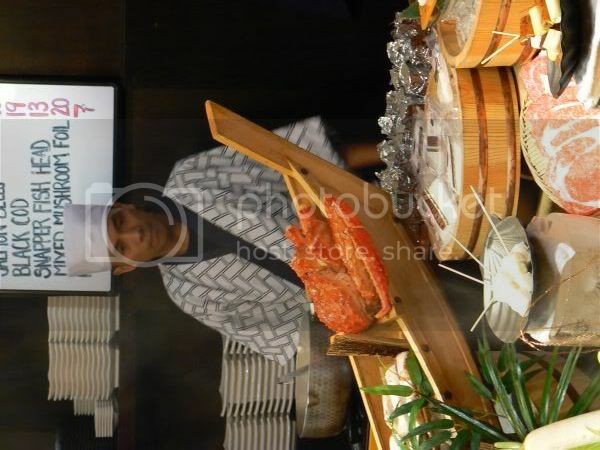 The food is pretty good and we wouldn't mind coming back to try the a la carte dishes especially the robata dishes. It was good fun especially after lots of Martell drinks and cam whoring with the food. I took a break from blogging yesterday as I wanted a good rest. It worked well as I'm back on my feet again (slowly). My total C diet also helped a lot - Vitamin C for boosting my immunity, Celebrex for the headache and fever plus Clarinase for the cold. Rather than deprive you of one more day without blogging, here's a huge dosage of pictures at this place we visited just this week. It's also appropriate for the weekend which is just round the corner. 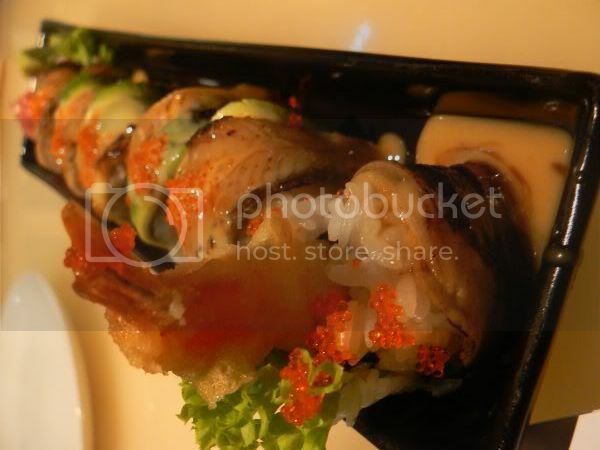 We were invited by a fellow blogger, dDoinkster Speaks to sample the food at this jazz club known as Groove Junction. 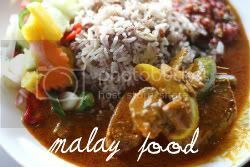 Located on top of Karma and opposite the Hong Leong Bank Berhad, it's a nice cosy place which you can enjoy good food while listening to live music. There's two chefs in the kitchen, Chef Ellena and Chef Panne. Chef Ellena is Korean and used to run a cafe at the Riana Green condominiums. We sampled quite a few items from the menu - first off were the appetisers - Mushroom Bruschetta and Yam Nam. 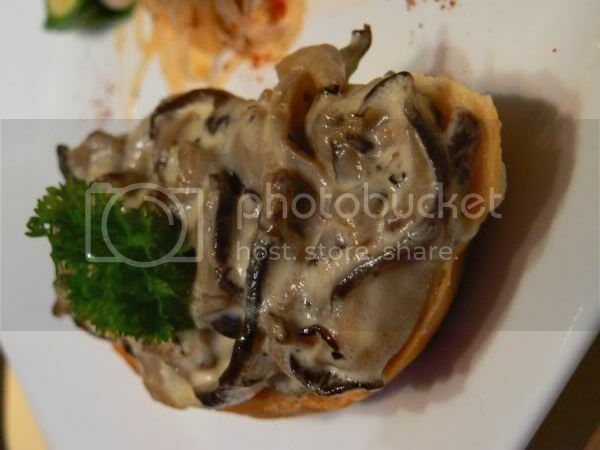 Mushroom Bruschetta (RM13.90) was seriously good, toasted french loaf topped with creamy mushrooms. I like how the cream sauce wasn't too rich and well balanced with the rich woody taste of the mushrooms. 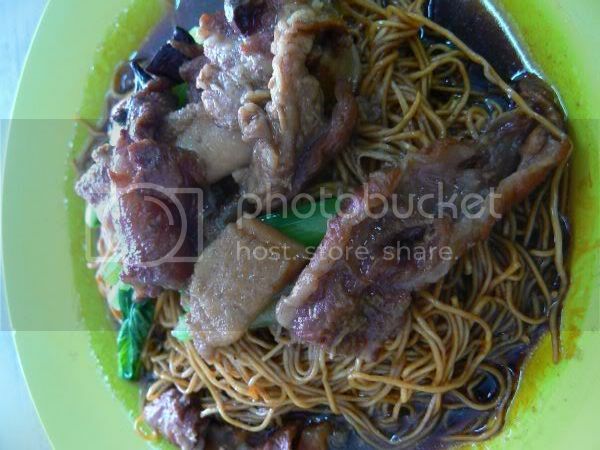 Next was the Yam Nam (RM15.90) - glass noodles tossed in roast beef slices. 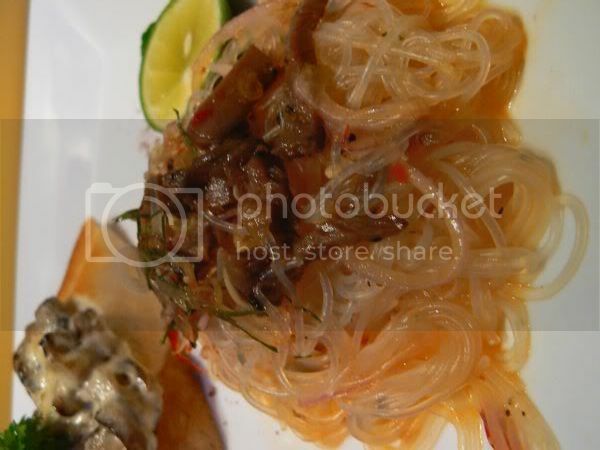 Squeeze some lime juice and toss the glass noodles with the chopped chilies for a piquant and spicy appetizer. There's also a kaffir lime leaf for additional fragrance. Although the portions look quite small here, note that these appetizers are samplers only of the actual size. 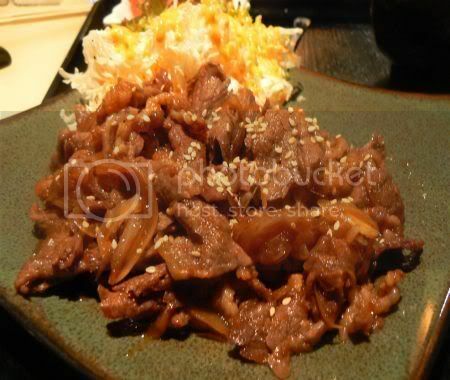 The food here is described as a fusion of East meets West with some emphasis on Korean dishes like Arirang (Beef Bulgogi with Rice) and Korean Noodles. Items on the menu have also been given names of jazz greats like Billie Holiday, Ellington, Ronnie Scott and etc. 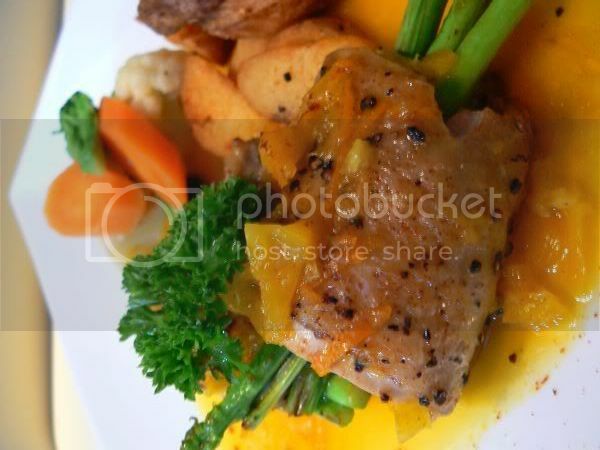 For the main meals, we sampled the Sonny Rollins - pan fried chicken rolls with orange sauce (RM21.90). Served with butter vegetables and potato wedges. The chicken was tender and I really liked the sauce. It was not too sweet or too sour. 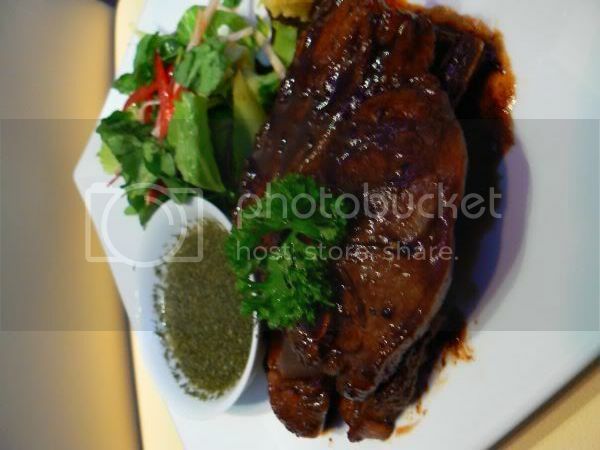 This was everyone's favourite - Ellena's Lamb Steak (RM25.90) served with mash potatoes and salad. Based on a secret recipe by Chef Ellena, the lamb is tender and so juicy. 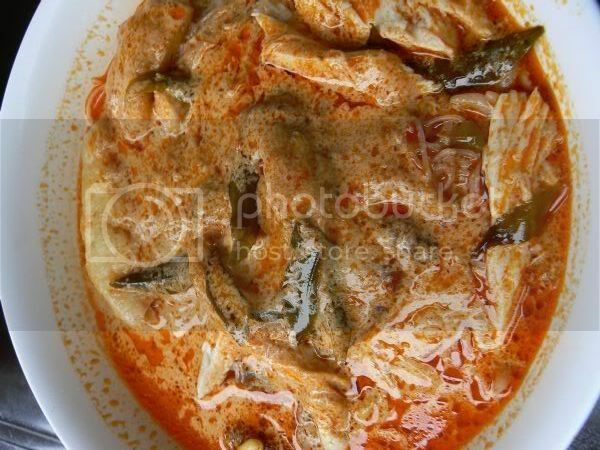 Seems she marinates it with a type of fruit hence the meat tenderises. 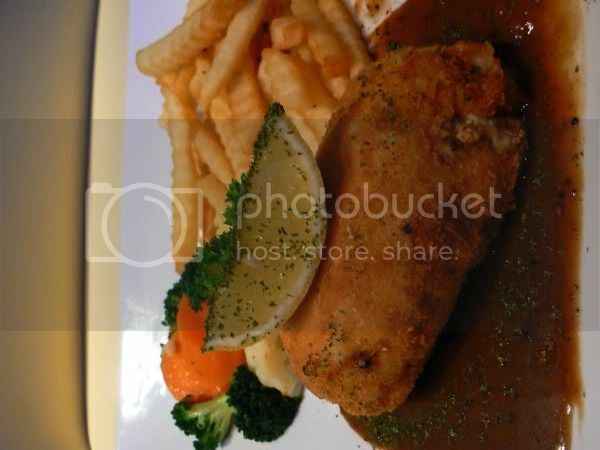 Next was the Dexter Gordon (RM28.90) - breaded chicken breast with a ham and cheese filling. Essentially a Chicken Cordon Bleu, I liked the thin layer covering the chicken breast. If you have seen the ones you get at say Secret Recipe, it's always so thick and dripping with oil. The filling is nice and juicy too. 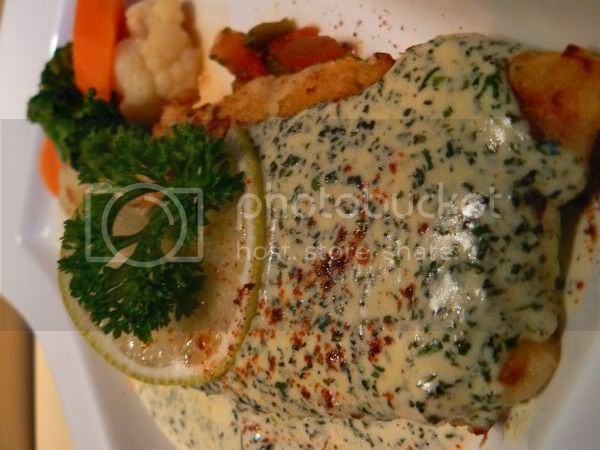 We also had the Billie Holiday (RM32.90) - pan fried sole served with creamy mint sauce. The sauce is not too rich with the addition of the mint leaves. 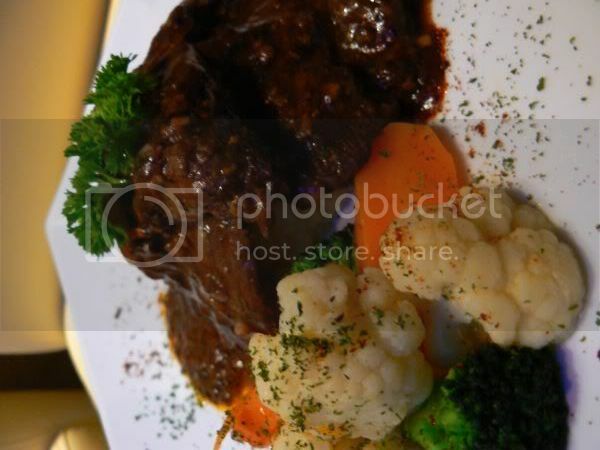 The Beef Panne (RM21.90) - grilled beef with herbs served with mash potatoes and buttered vegetables was also delicious. Tender beef slices mixed with a nice herby sauce. They also serve a variety of finger foods - perfect for nimbling the night away while you listen to the music. 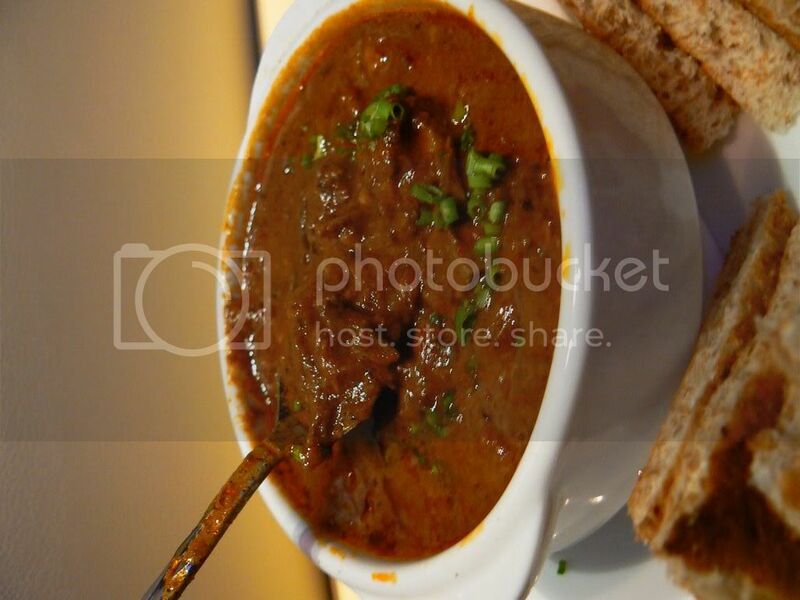 There's lamb curry with toasted bread (RM15.90) if you wish for something spicy. Try the Fried Chickalinas (RM15.90) if you want a more substantial snack. 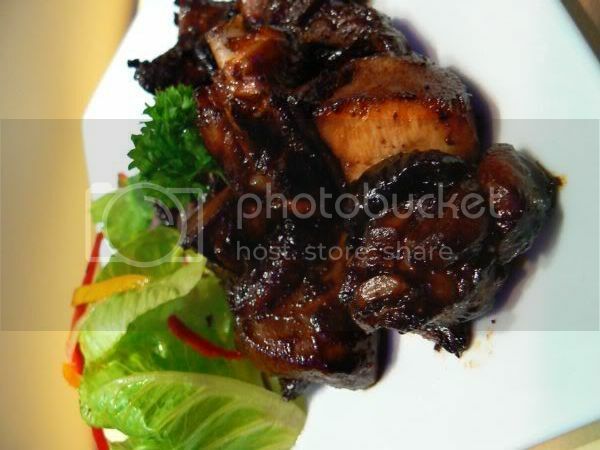 Tender pieces of chicken is marinated in a special sauce that reminds me of char siu minus the sticky sweetness of honey. Don't forget desserts - there's a small selection of it. Start with Tiramisu(RM12.90) served with whipped cream and fruits. Nice and light, the cream base is not too rich. 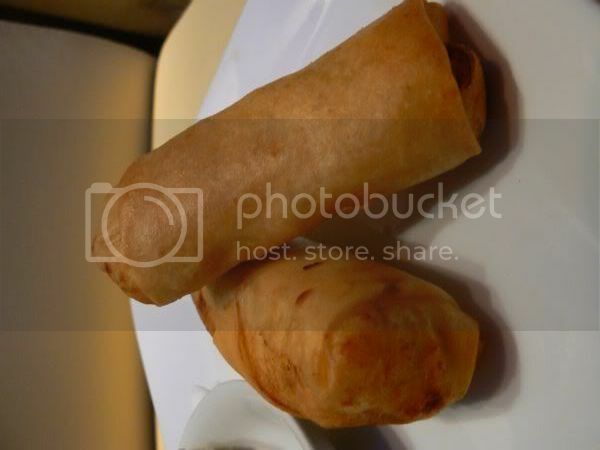 Then there is the Roll Morton (RM14.90) - Creamy Banana Rolls with Ice Cream. 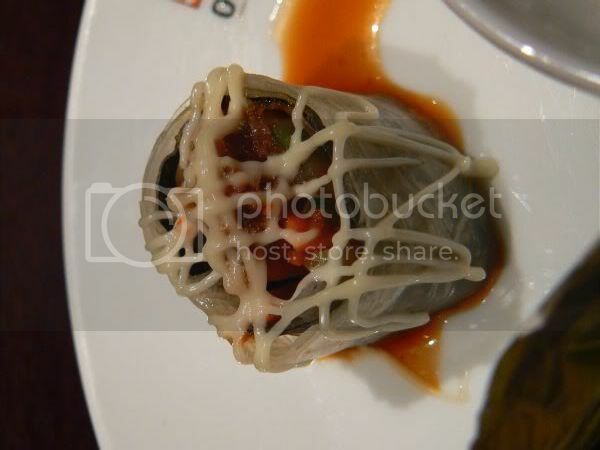 Eat it while it's hot as the filling is deliciously fragrant and made from Pisang Berangan. 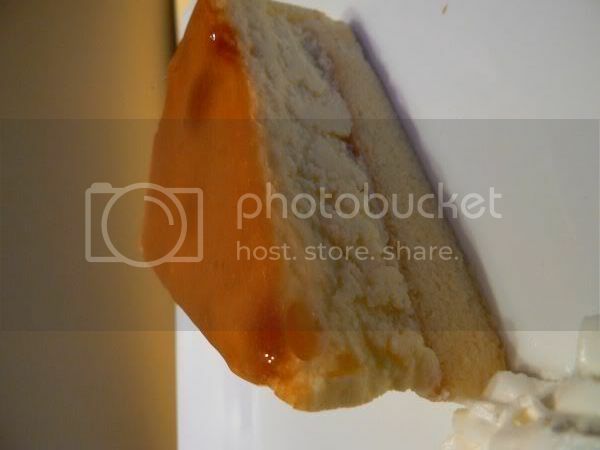 Last but not least, there's the GJ Cheesecake (RM12.90) - creamy cream cheese on top of a light sponge base. On the music side, there's a live band every night from 10 pm onwards. Every night there is something different, the night we dined here it was Bossa Nova music with Cheong which was really good stuff and pretty romantic. On Sunday, there's live JAM sessions and Juwita Suwito will be performing on this Friday and Saturday night. For the full details of the schedule, go to Groove Junction's website. Thanks so much for dDoinkster Speaks for organising and to the Groove Junction people, Joanne and Jennifer as we all had a great time. It was nice meeting KY Speaks for the first time and also seeing Riz and Lyrical Lemongrass again. Short post for today as I'm beginning to feel the effects of a bad flu bug starting. Sniff! One of my favourite places to eat is at this coffeeshop behind Hock Lee Supermarket. Lots of good food here and although I love the char kuey teow and rojak here, another favourite is the curry laksa. Run by two sisters, they also serve char siu wantan mee or chicken feet with mushrooms but I usually eat the curry laksa. 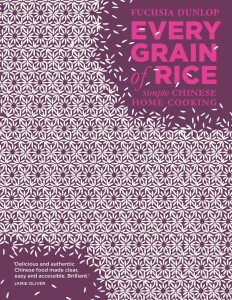 It's also a favourite of my mother's that now the two ladies even know her preferences whenever she places her order. It looks scarily cholestrol laden above probably because the lady scooped up all the coconut milk on top of it! Another favourite from this stall is their chinese new year cookies which we buy every year - I love their little dragons ( a softer version of kuih bangkit) which melt in the mouth.